There are many chains serving average hamburgers. At The Hangout, we do things a little differently. We have the Best Burgers in Orange County for value and service. We use fresh ground sirloin. 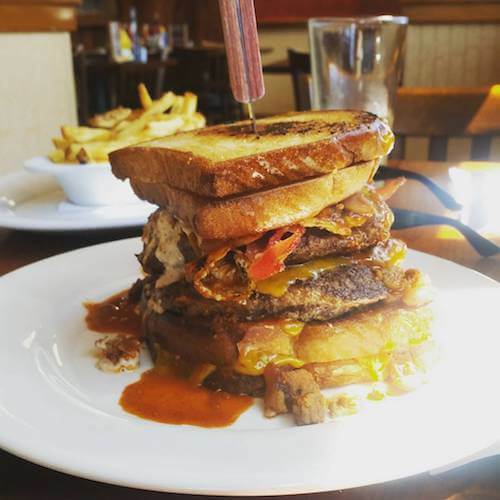 Each of our 10 choices, comes stacked high with fresh ingredients on Toasted Buns. We take it to the limit! Included are a side of mouth-watering Yukon French Fries. Their hand cut. We carefully select the right produce, cook Choice Beef to perfection. And it's topped it off with our tantalizing House Sauce. Unlike fast food places, we have better quality with with unmatched service. Our casual atmosphere is far more comfortable and relaxing. The Menu has been painstakingly put together to offer great value and numerous choices. For the best hamburgers in Orange County near you, restaurants are right off the 405 and pacific Coast Highway. Sip on one of our many great drinks. Choose from a range of Great Craft Beers on draft or refreshing Cocktails. With TVs throughout, catch the latest Sports Game. You won't miss a thing. Trusted the reviews and I'm so glad I did! The service and food were outstanding. The burger (hangout!) was incredible with fries and bbq sauce. I'd come back to Seal Beach for this. I'm picky about my burgers and bbq and The Hangout did not disappoint! Here's a few popular choices. For our full list, visit our menus. Drop in if you're in the neighborhood! Fresh-cut Onion, Whiskey Braised Onion, Onion Rings, Lettuce & Tomato Smothered in a Guinness Cheese Sauce. This might be the biggest burger in Orange County. This is serious business! Here's the play by play... A Double Beef Burger AND then Double the Cheese, AND next Double Bacon! A Fried Egg right on top with Chili, Lettuce, Tomato, Onion, Pickle AND finally Two Grilled Cheeses as the Buns! Lastly, our House Sauce drives it home. Bang! Everyone needs a little something in their life to kick it up a tad. Our Jalapenø Hamburger is cooked to perfection and accompanied by Pepper Jack Cheese, Grilled Jalapenos, AND yes, Crispy Onions. Our Memphis BBQ sauce completes it. We recommend a pilsner raft beer on draft. This is as good as it gets. We pile Fresh Lettuce, mouth-watering Tomato, Onion, Pickle and yes indeed our House Sauce. Our Signature leads the pack. Fresh Local Lettuce, Sliced Red Onion with Ripe Tomatoes, pickles. Choose your Cheese: Pepper Jack, Swiss or Cheddar. Topped with our House Sauce. 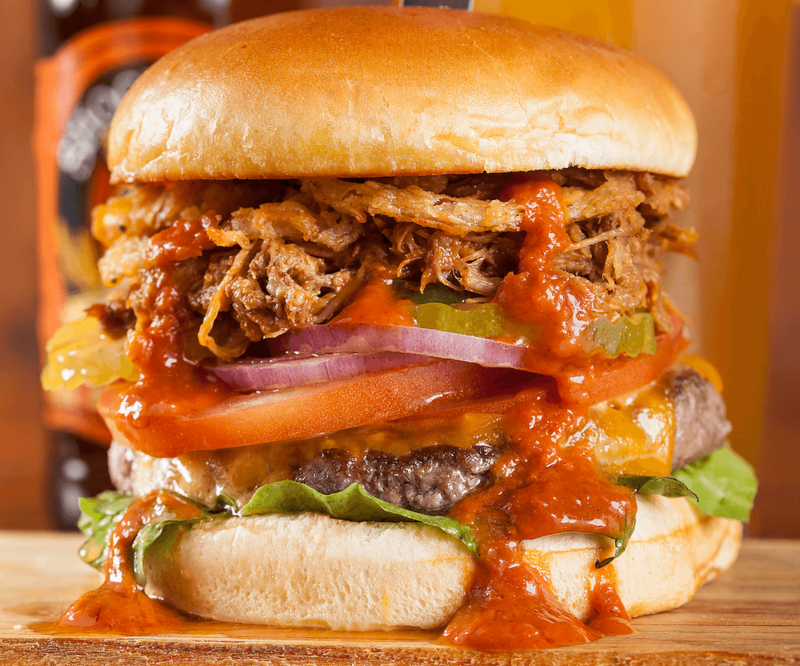 Tasty Pulled Pork, Cheddar Cheese with Fried Onions and Memphis Barbecue Sauce. 1/2 Pound Beef Brisket & Ground Sirloin Patty, cook it to perfection then top it with your Choice of Cheese, Fresh Lettuce, Tomato, Onion & Pickle. It's as good as it sounds! 'Where's the best burger places nearby? Our locations in Southern California are near Long Beach, Bella Terra, Bolsa Chica, and Fountain Valley. Our relaxing atmosphere and great staff makes it worth the drive. At The Hangout, bring your appetite to the best hamburger restaurant in downtown Seal Beach. Experience spectacular views of the ocean and pier. Our Restaurant/Bar features several TVs throughout. Catch the latest Sports Game. Sit at the Bar and chat with locals. Throw back a few of our tasty Craft Beers on draft. We also have some great Cocktails you won't find anywhere else. Take a walk on the Pier afterwards. There is free parking for 2 hours on Main Street. Parking next to the pier for 2 hours at $3 or daily for $6. Seal Beach Main Street offers a variety of great shops. For late night food, we serve until 10:30 pm. Takeout available. Visit Hangout Too for Huntington Beach burgers. Relax at an indoor/outdoor restaurant bar convenient to Bella Tera. It opens to an outside seating patio. Choose from the vast selection of craft beers to macro beers on draft. For mixed drinks, chose from great cocktails with our unique take. It's a great burger place to hang out or catch up with Friends. There are plenty of TVs throughout to stay up to date during the Playoffs. We're also one of the few Burger Restaurants that's dog friendly. Enjoy plenty of free parking with no time restrictions. One bite and you'll know why. Join us for an experience.